Rent Full Court Press Inflatable Basketball Game - The ultimate hoop dream: interactive basketball, fast-paced, and fun! When a basket is made, the ball rolls over to the opponent's side. The first player to clear the balls off their side wins! Full Court Press - The ultimate hoop dream: interactive basketball, fast-paced, and fun! When a basket is made, the ball rolls over to the opponent's side. The first player to clear the balls off their side wins! Can also be converted to a full-sized double-shot basketball game where 2 players compete to see who scores the most shots in a 1-minute time period. Great for a Basketball Theme Bar/Bat Mitzvah Party or Sports Party. Includes: Inflatable, 6 basketballs, 1 blower, timer, score keeping counter, and 1 attendant. 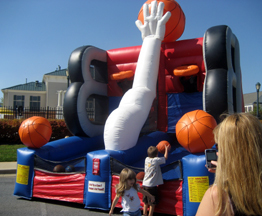 If you have a basketball theme party, take a look at our other basketball related rentals: NBA Size Basketball Goals, Bank It Basketball, Sports Basketball Painted Backdrop, or our Water Basketball.